3 July 2018 – London, UK - Asset and service data hold a myriad of insights for companies that extend far beyond service operations. 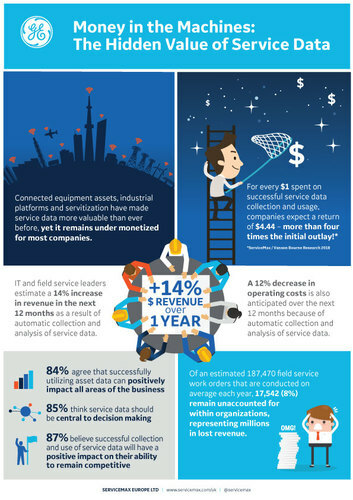 New research, “The Rise of Asset and Service Data Gravity”, by Vanson Bourne, sponsored by ServiceMax from GE Digital, has identified the hidden and value of asset and service data in customer equipment and machinery. In addition to more than a four-fold return on successful service data collection and usage, companies can also put an end to costly 8% annual contract leakage and boost revenues by up to 14%.